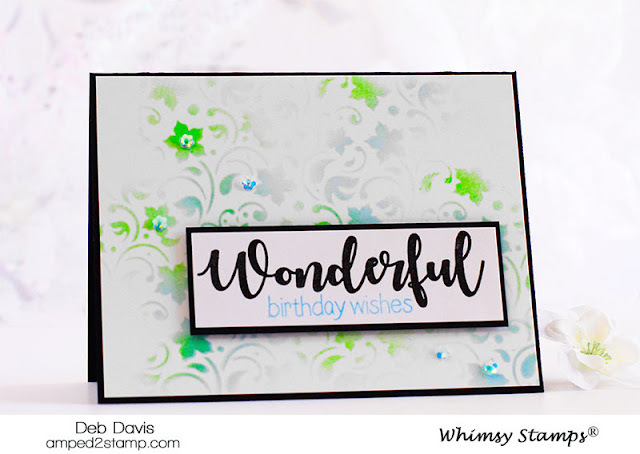 I have two super quick cards to share with you today and they were both made using just two of the same products. 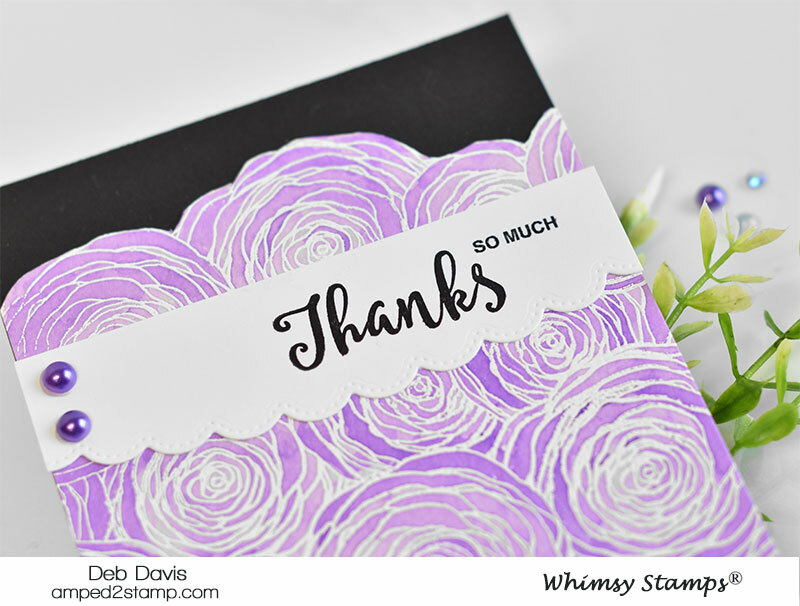 The sentiments are from the You're My Favorite clear stamp set, a versatile set that allows you to build countless custom sentiments. 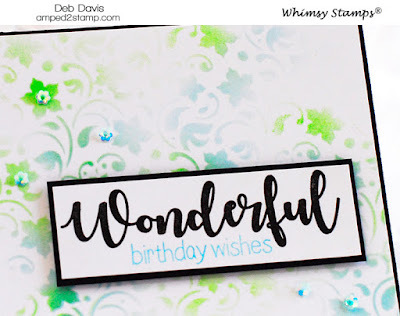 Whimsy Stamps has several build-able sentiments sets like this, and they even have a couple matching dies to go with them too. You can check out all the others ones HERE. And to finish up I also added a little Wild and Free sequin bling on the birthday card. Isn't this little Tabby Tiger just too cute for words?! 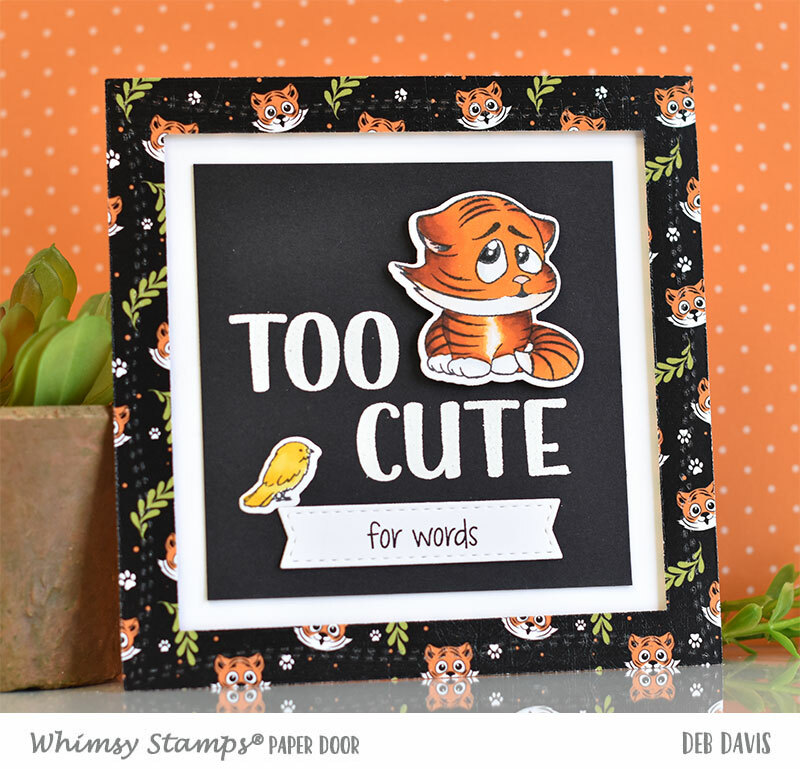 And all the other little tabbies in the set are just as cute! 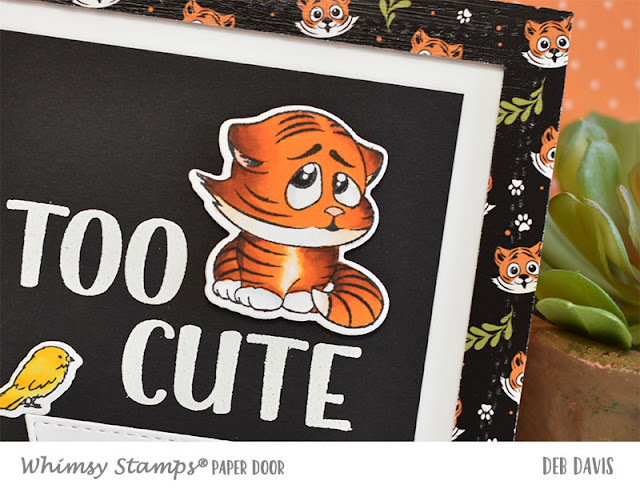 While this PAPER DOOR stamp set is called Tabby Tigers, they could simply be a different color to make them tabby kitties. For that matter this little guy could be an orange tabby. 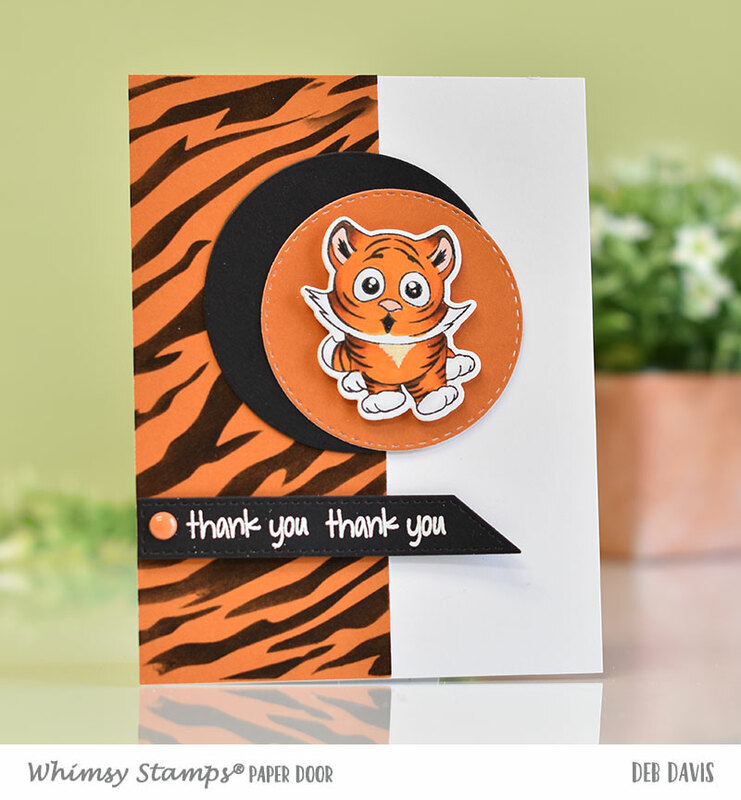 But for today I'm using the tiger patterned paper included in the PAPER DOOR kit so he's a cutie tiger. 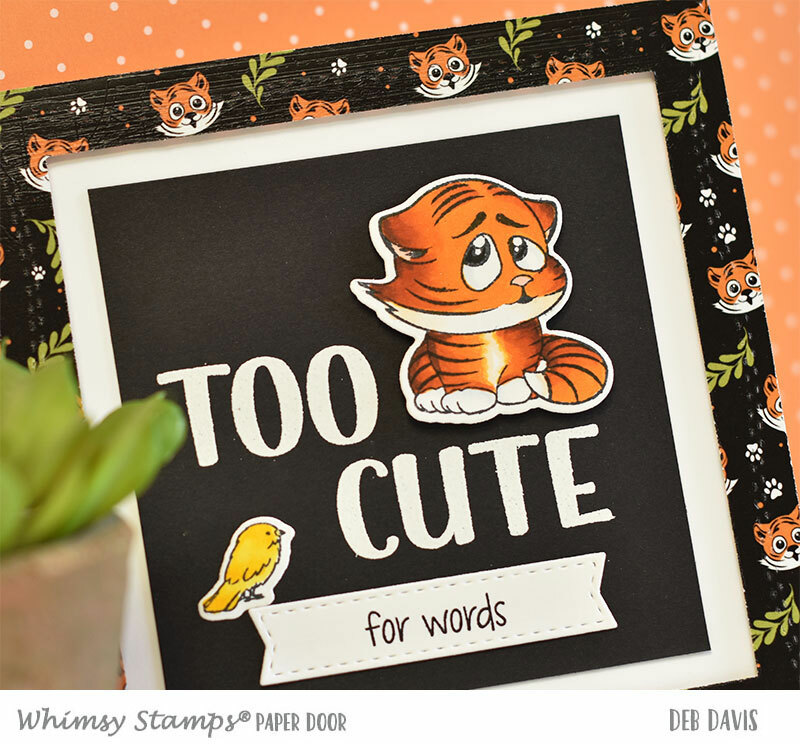 I used the square from the Shaker Maker Combo die to cut out the tiger paper frame. 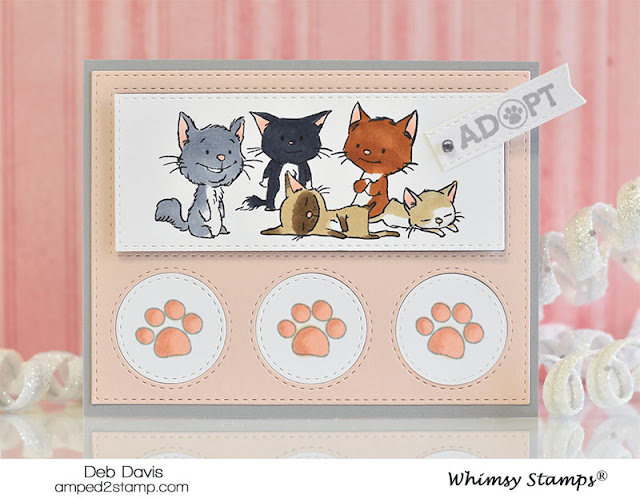 This die is 5.25 x 5.25 and is PURRfect for square cards, I rarely make a square card without it (love). 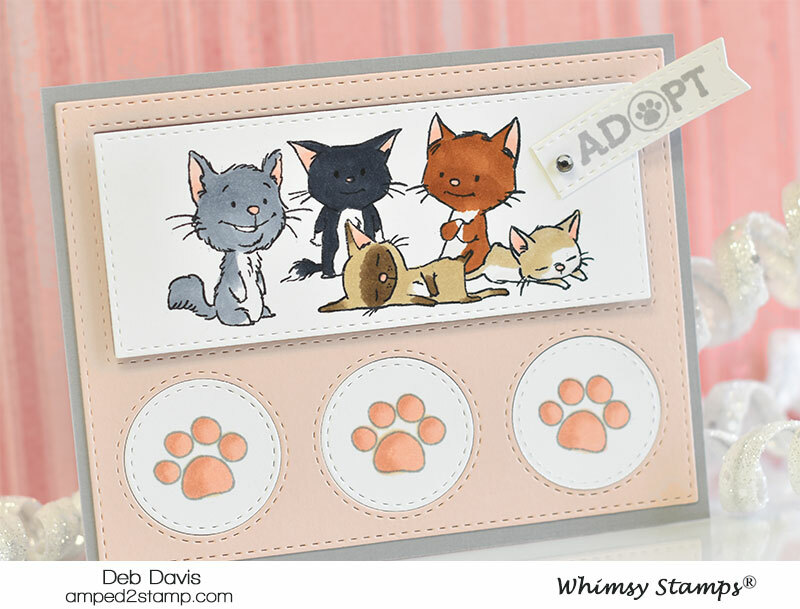 I stamped the Tabby Tiger and the birdie, colored them with Copic markers and cut them out with their matching dies (included in the kit). I heat embossed the "TOO CUTE" sentiment which is from a separate 3x4 stamp set also included in the Tabby Tigers Paper Door kit. 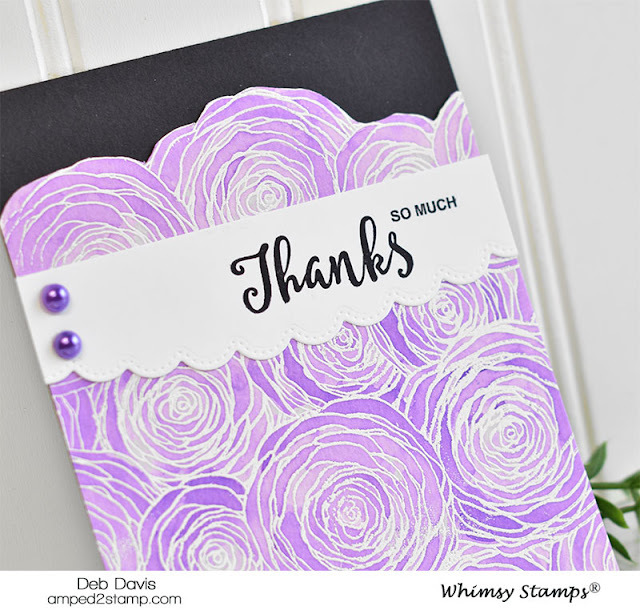 Then stamped the coordinating sentiment and cut that out with one of the Quick Strips dies, told ya I would use this die set on almost every card I make from now on ha. I added foam tape to the back of the tiger frame and adhered that to a 5.25 x 5.25 white card base. Then put the completed black square with the sentiment and critters glued it flat in the center. The tiger is popped up on foam tape too. Our NEWLY redesigned PAPER DOOR kits are creating quite the ROAR. 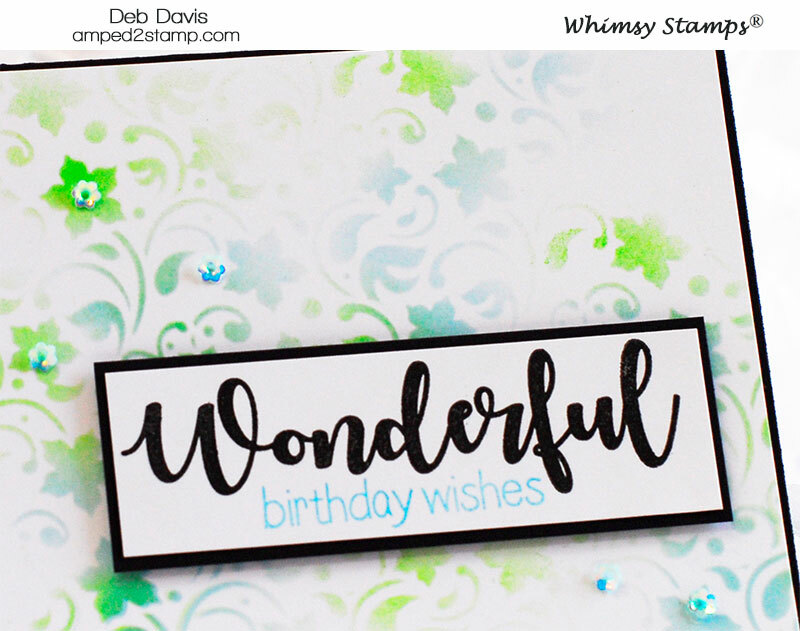 There's so much value in the kits, they are only $29.95 (plus shipping) but you get $50+ worth of Whimsy Stamps PAPER DOOR exclusive products! Thanks for stopping by...see you soon, hope you have a TIGERiffic day! 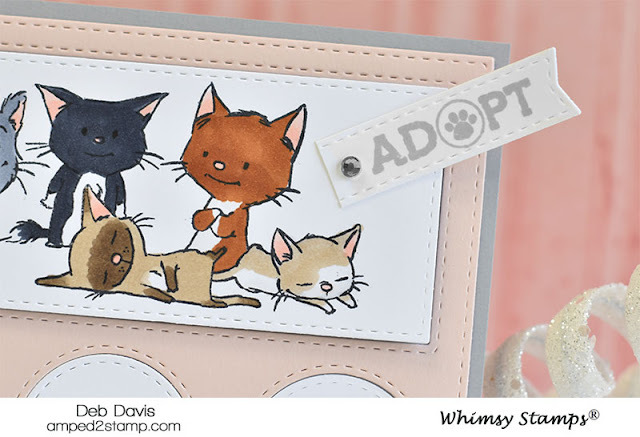 Hey there Whimsy fans and animal lovers, have you seen the NEW Adopt Don't Shop Cats and Adopt Don't Shop Dogs clear stamp sets yet? 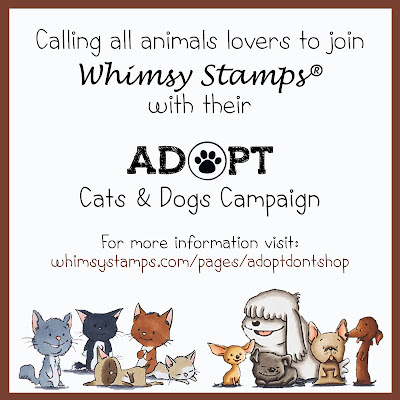 And did you know that Whimsy Stamps will donate $1USD for every Adopt Cats and Adopt Dogs stamp sets that are sold?! 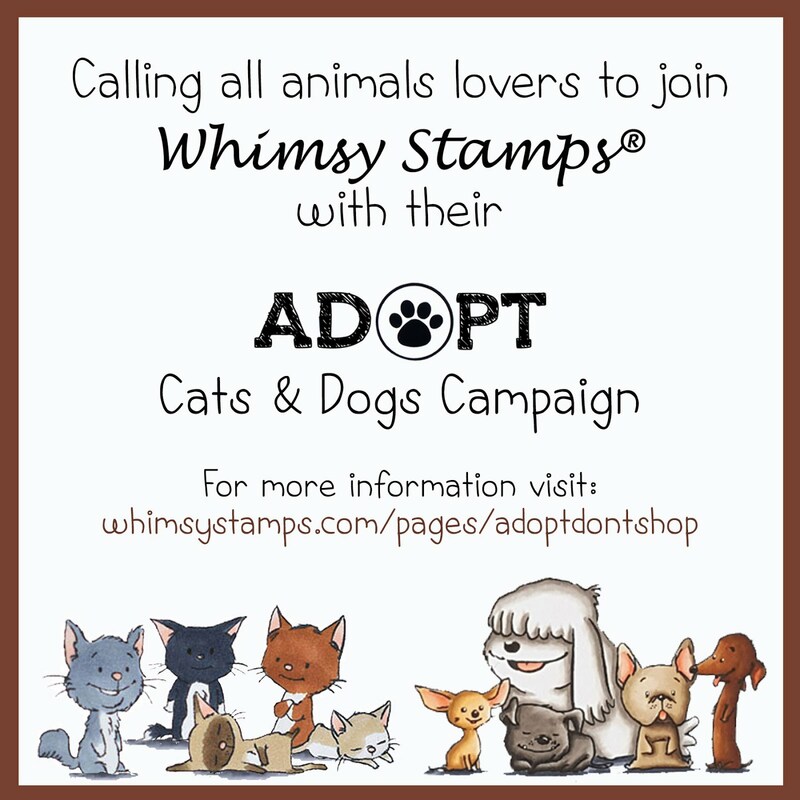 And to celebrate this campaign we're having a Facebook party from Feb 14-17th come and join the fun, games and prizes for all our animal lover friends! You can find the event HERE. Today I'm sharing a card made using the Adopt Don't Shop Cats set, and the NEW Peekaboo Window 3 die which is a perfect match for this and so many other stamp sets. I cut out two Peekaboo Window 3 dies, one from white card stock and one from the pinkish cardstock. I stamped the kitties on the white panel and colored them with Copic markers. It's so fun watching them come to life when coloring them different ways. 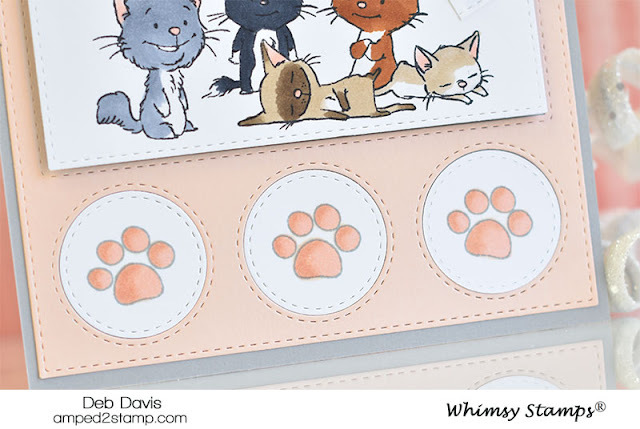 Then I stamped the paws on each of the white circles and colored them with Copic markers too. I used one of the Quick Strip dies and stamped the "adopt" sentiment, then snipped off the end and added a little rhinestone for some shiney ;). I matted everything onto a grey card base and popped up just the large white panel with foam tape to give the main image a little more dimension. If you love animals and if you like our message feel free to share the Facebook event and/or anything else about our efforts. Have a GRRRReat day and thanks for your support! Thanks for stopping by...see you soon and HAPPY VALENTINE'S DAY too! 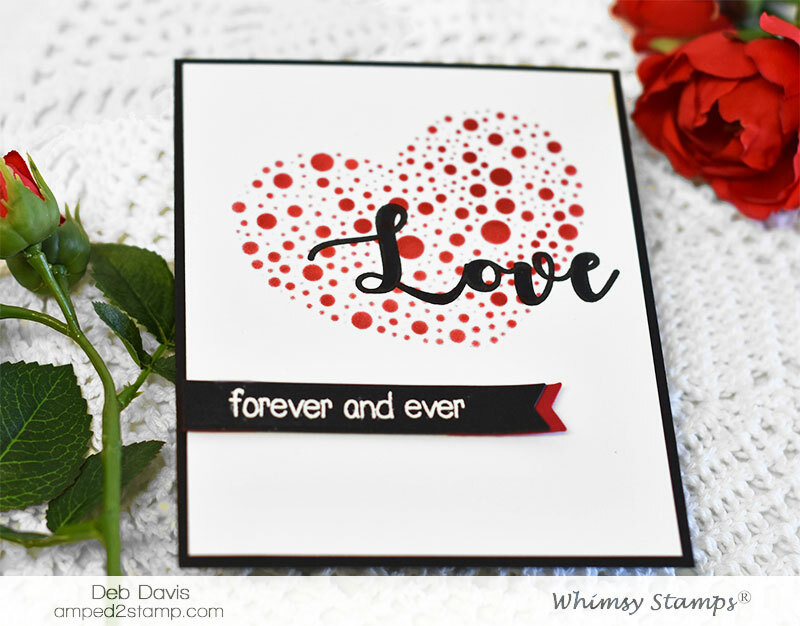 Here's a quick, clean and simple Valentine card for your special someone. I started out using the Speckled Heart stencil and sponged on red ink onto white card stock. Then stamped the "Love" sentiment using the You're My Always clear stamp set. 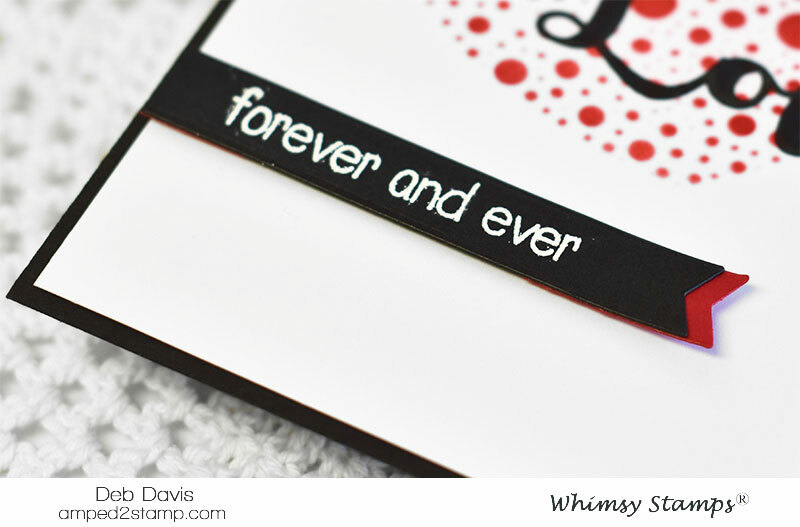 I heat embossed the rest of the sentiment with white embossing powder on a black "Quick Strip" die. I cut a second quick strip from red card stock to matte underneath it for another little pop of red. 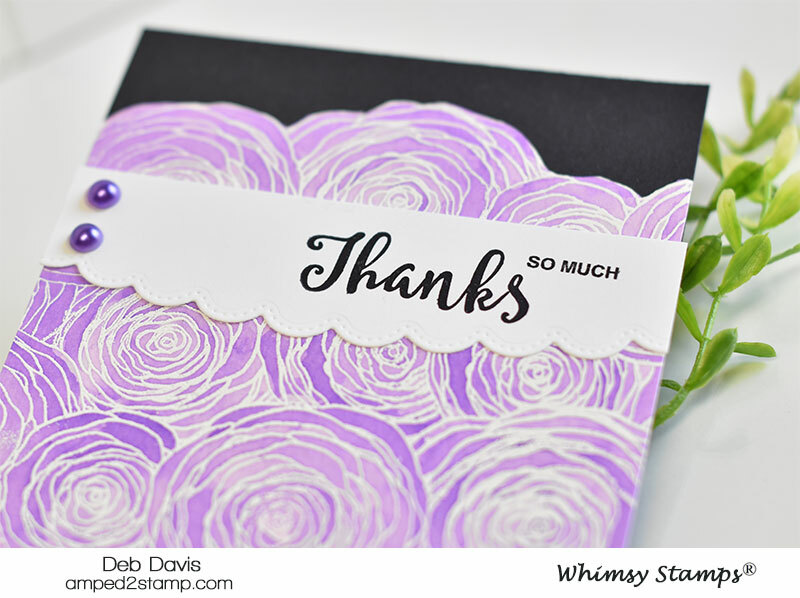 I'm lovin' the Quick Strip dies, and I can see me using them on pretty much every card I make - ha. 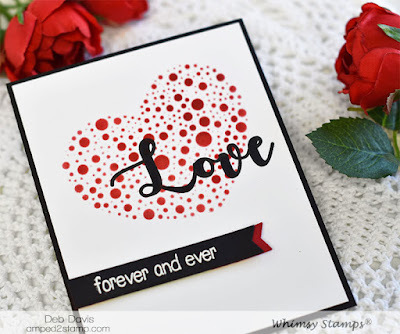 I hope you have a love filled Valentine's Day XOXO! 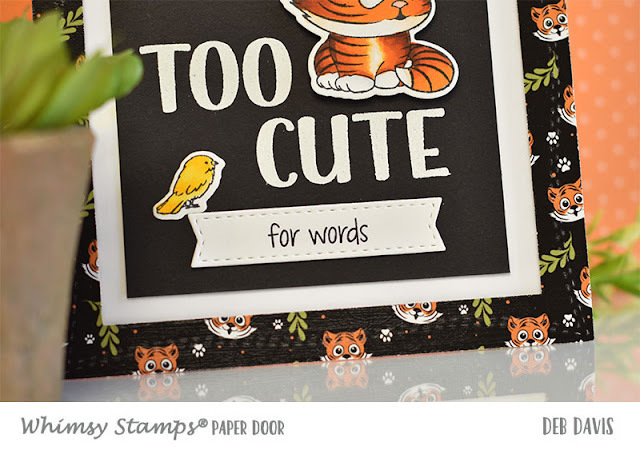 The NEW February PAPER DOOR kit Tabby Tigers just released 2 days ago and is getting ROARing reviews! How couldn't it be when it includes these adorable Tabby Tigers that can also be tabby kitties too?! 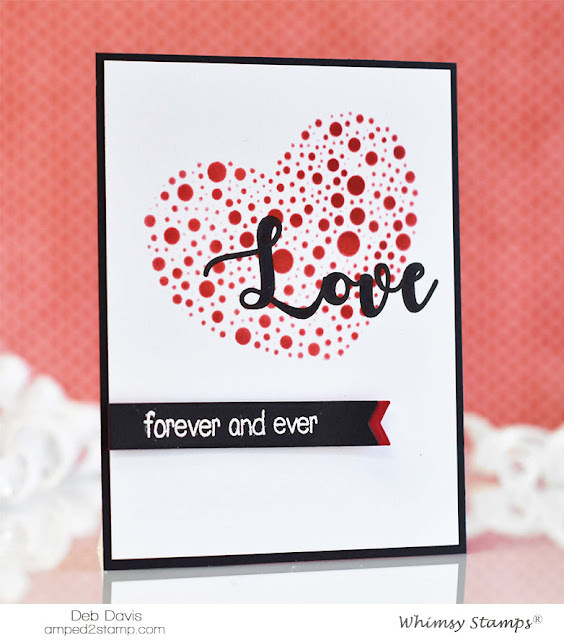 There's a custom 6x6 double sided patterned paper pack included in the kit and some of them have solid sides. 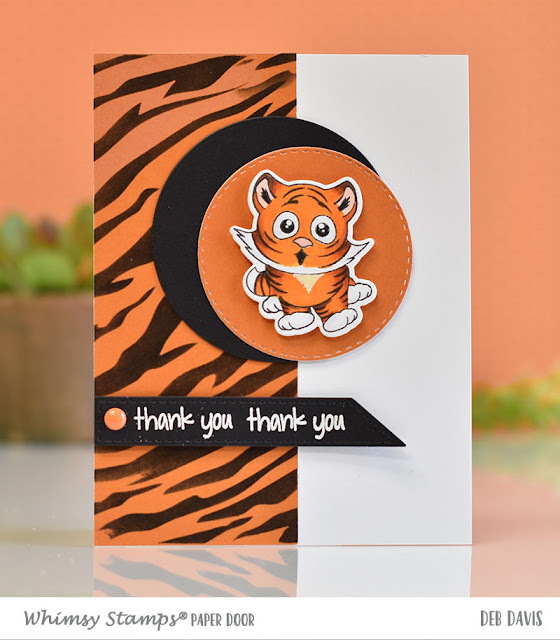 So I used the orange solid (it's the one with suns on the other side) and used the tiger stripe stencil also included in the kit and sponged on black ink for the background. I stamped on of the Tabby Tigers and colored him with Copic markers then cut him out with the matching dies included in the kit. Don't you just love that expression on his face :o)? 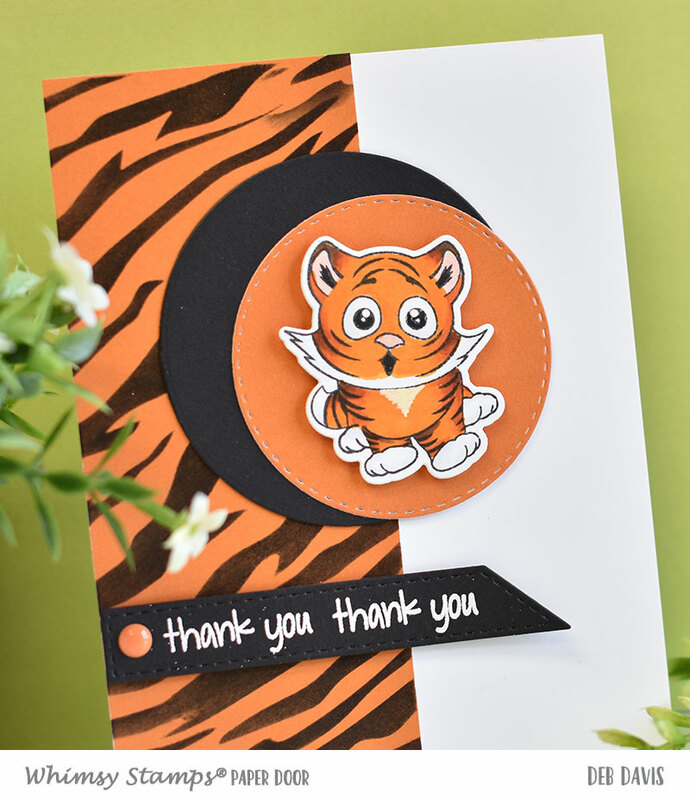 I cut two circles, one from black card stock and one from the same orange I used for the stencil and popped the little tiger up with foam tape. For the sentiment I heat embossed that with white embossing powder then cut it out using one of the Quick Strip dies. For the final touch I added a Summer Breeze Enamel Dot which matched the card colors perfectly. 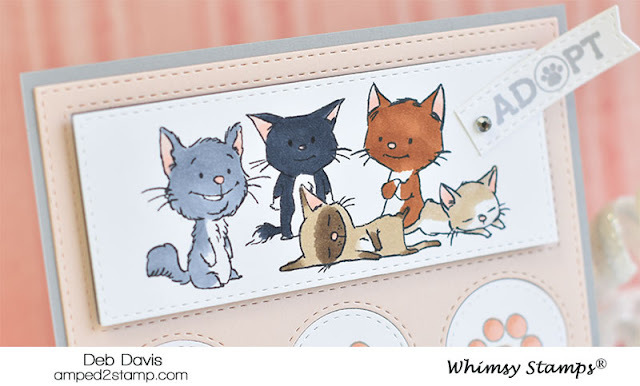 Our NEWLY redesigned PAPER DOOR kits are a killer value, you get $50+ worth of brand new Whimsy Stamps products for only $29.95! There are only a limited number of each kit and they sell-out fast so don't wait...get your today!